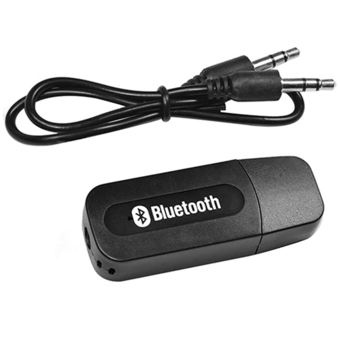 Bluetooth Music Receiver BT-163 Let ordinary speakers instantly become wireless bluetooth stereo audio music speakers, it could be paired to most bluetooth enabled devices, such as iPhone, iPad, Samsung Galaxy, HTC, and other devices. For no USB Port Speakers : Supply power to the device by connecting charger with 5V USB interface, then connect the speaker's AUX port with the audio cable. For Speakers with USB Port : Connect the device with speaker's USB port directly, then connect the Speaker's AUX port with the audio cable.